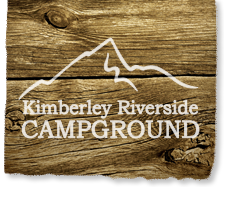 The Kimberley Riverside Campground has 20% of the campground reserved for seasonal guests. Our seasonal guests stay with us from April to October and have first refusal on their site the following year. If the seasonal guest does not renew for the following year before Oct 31st, any available seasonal sites will first be offered to our current seasonal guests that would like to move elsewhere in the campground. If more than 1 of our current seasonal guests would like the specific spot that has come available, a raffle for the site will be held. Once our current seasonal guests have made a decision, any remaining campsites will go to our seasonal raffle. decision. After 24 hours, any sites that haven’t been booked will be re-drawn until each site is filled. A 1-month non-refundable deposit is due by October 31st to guarantee your site for the following year. This deposit is non-refundable. The other 50% of the balance is due on or before July 1st 2018. Please remember that rates are subject to change annually and are based on supply & demand, rate of inflation, quality and offering of services/amenities and our supplier rate increases. On occasion, the rate change may follow our nightly increases. • Your site fees cover your stay with us from April 15 – October 15 (weather permitting). Winter storage is permitted on a seasonal basis following the summer you stayed with us. • Your site fee includes Electricity, Water and in the majority of cases, Sewer hookups. You will have access to the swimming pool, free showers, washroom facilities and Wi-Fi in the designated Wi-Fi hot-spots. • Sheds or storage units are NOT allowed on camp sites. A few guests currently have 3’ x 5’ Rubbermaid containers on site, which will be permitted only if placed discretely on your site (i.e. tucked behind or beside your trailer and are not overly visible to other guests). • Small decks are permitted as long as they are removable and must be contained within the gravel pad, with a max size of 6’x 8’ x 30”(h). Planned size and location must be approved by management prior to purchasing or assembling. -Tarps are not permitted to cover stacked firewood. -Firewood storage should be no larger than 3’ high x 4’ long when stacked in your site. Any firewood beyond this must be stacked neatly under your trailer or removed. -If you are planning to purchase firewood in bulk, please ensure it is from a local source (i.e. Kimberley) as bringing in firewood from other regions can spread tree born disease and kill our local forest – this is a BC Forestry Regulation and information can be obtained from our office. • Any additional Tent(s) are not permitted unless approved by management and they must fit on the gravel portion of site. This is extremely important for erosion control and maintaining important natural habitat between sites. Tents and foot traffic will permanently kill the native ground cover. • Satellite Dishes: Please do not secure to trees. Satellite dishes must be fixed to your RV or mounted on a tripod/stand. Please find a discrete location (contained to your site) when using tripods and stands. Please do not have them too close the roads, they are unsightly and are at risk of being damaged. • Site cleanliness and accessories: Please refrain from decorating your site with too many accessories (i.e. lawn ornaments, XMAS lights, and unnecessary vehicle and/or RV accessories for example). These items can take away from the natural setting and overall wilderness camping experience that we try to provide. We also request that sites are left clean & tidy and any equipment, bikes or toys are stored discretely and securely. If your site requires any maintenance such as the firepit being shoveled or tree pruning, please contact the office and we will be happy to help. We do encourage beautification of the grounds, if you have any flowers or planters on your site we thank you! If you would like to water some of the green space around your site, please only water on even numbered days, as per city bylaws. • Friends and family using sites: We politely ask that you confirm with the campground office if you are planning to have anyone use your site (other than by the seasonal family it has been booked under originally). To do this, you need to stop by the office to let us know. There is no charge for this *if* your site has 5 (or less) people staying in your trailer. If your site exceeds 5 people overnight there will be an additional person charge of $3.00/extra person/night. • Please note that any daytime visitors to your campsite are not considered registered guests and are not permitted to use the swimming pool, showers etc. If you would like them to be able to enjoy the pool with you, they will need to be registered to your site and the additional person charge is $3.00/person each day (as long as your site doesn’t exceed 5 people). We reserve the right to decline the use of these facilities at any time - priority will be given to our usual seasonal and nightly campers when at 100% occupancy. • Children are your responsibility and need to be supervised. Children without supervision can cause upset for other guests, particularly when they are playing/having water-fights in the bathrooms, playing outside late at night and on occasion during the daytime when the noise is unnecessarily loud. We understand that kids will be kids and making friends while camping is FUN! Please be mindful for those others who don’t have children as they are here to have a relaxing holiday too. Please also remind your kids of bike safety, we have had multiple incidents of children riding unsafely and almost being hit by vehicles when they come flying around the corners. • The Kimberley Nature Park is the nearest off-leash area and you are welcome to walk your dog’s off-leash there. If you choose to walk pets in the campground or on the campground trails, they need to be leashed. • 2 Vehicle Max: In addition to your RV, you are permitted a maximum of 2 vehicles and they need to be contained to the gravel of your site. If the vehicles don’t fit, or more than 2 vehicles are on your site, they will need to be parked in guest parking. Guest parking is located by the office or by the centennial trail entrance. • Winter storage: If storing your RV for winter, we politely ask that your site is left clean of all camping accessories and the only thing that remains on your site is your RV. We ask that BBQ's, bikes, patio furniture, and any other camping accessories are not left outside. These items should be taken inside your trailer or taken home as they are at risk of damage from heavy snow loads, falling branches and/or theft. • Free winter storage is included in the fall & winter following your 6 month stay, on the condition you renew for the following year. If you decide not to renew, you will need to have the trailer removed by April 15th. • Portable 10x10 shade/screen tents should also be taken down during the winter, or at a minimum please only leave the frame up. • Please ensure you have sufficient insurance as the campground is not liable for any damage (either caused by mother nature or human caused) or theft. Although in the winter we do check the campground occasionally, please be advised any repairs or issues (at any time) are your responsibility and you will need to make arrangements to rectify these issues. Vehicle access during the winter is not possible, bring boots, cross country skis or snow shoes if you plan on coming out! There campground gate is locked and there are no services available. • Consistently late payments (without prior arrangement) are not permitted and any seasonal accounts not in good standing will be terminated without refund. • Seasonal guests are also required to follow all campground policies and quiet times, the same policies that our nightly guests are expected to follow. These additional campground policies can be found on the reverse side of the campground map. • With the intent of providing all guests with the best possible stay, we reserve the right to refuse problem guests or visitors. Any infraction of the policies may result in your camping privileges being revoked. We reserve the right to refuse continuation of your seasonal site without notice or refund to any person or family whom causes a disturbance or becomes a nuisance. Threatening, swearing or any inappropriate or unwelcomed behavior towards the staff, the guests or any fellow seasonal campers is strictly not tolerated. For any infractions, a verbal discussion between you and Management will be had, any additional complaints or infractions against you will be documented and your site will either be terminated immediately or at the end of the season, depending on the severity of the infractions. • Seasonal sites are offered on a 1 season (6 month) basis and rebooking for the following season is by invite only. You will be invited to return to your seasonal site for the following year on the basis that you are compliant with the policies we have in place. • Camp Hosts: We have 2 camp hosts that alternate every 2 weeks monitoring the campground overnight. They are not here to supply late-night firewood purchases, late night check-ins or to clean the bathrooms! Their role is simply to monitor the campground and implement our quiet time of 11pm. •With our emergency response plan in place, we need to keep track of when seasonal guests are staying at the campground, to help smooth the evacuation or emergency response process. Please stop by the office and sign in when you arrive for your stay and sign out again when you head back home or have left the campground for more than one night. Time is critical during an emergency and continually checking seasonal sites that are vacant for weeks at a time isn’t ideal!